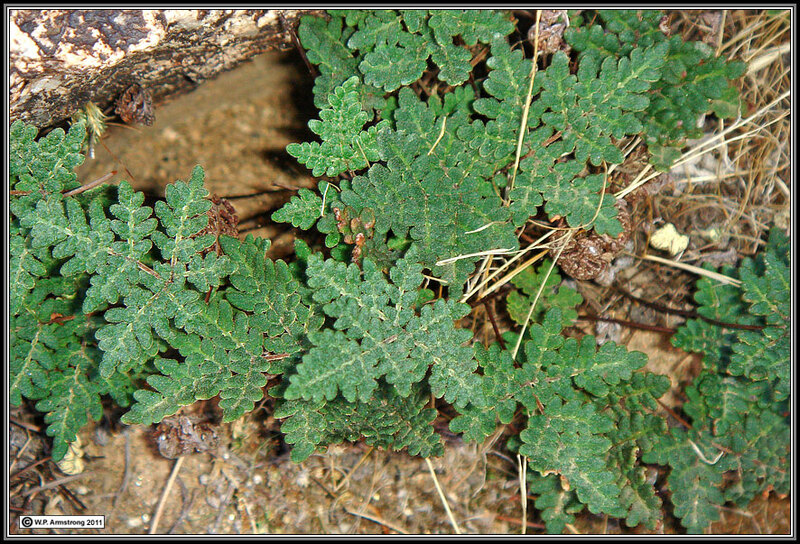 California cloak fern (Notholaena californica). 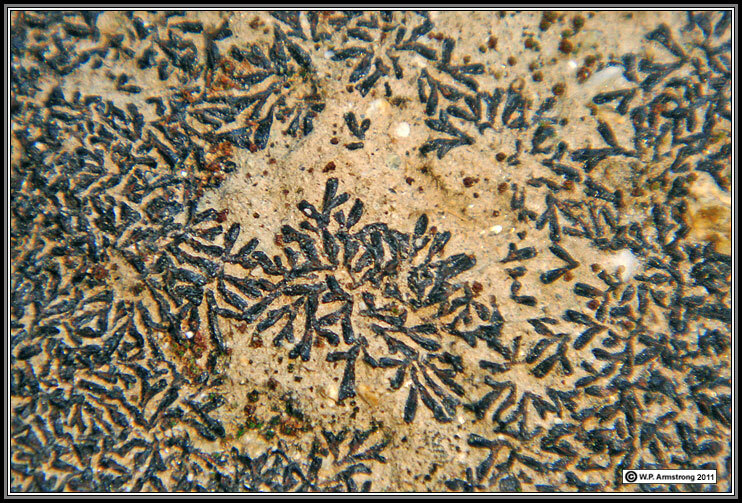 The slender, black threads with dichotomous branching are the rolled-up, desiccated thalli of a liverwort (species unknown). 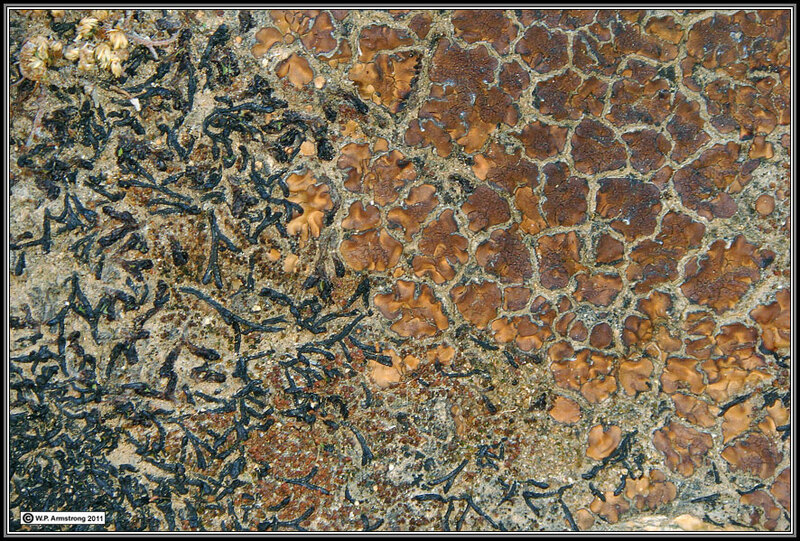 The brown, scale-like soil lichen is brown earthscale lichen (Placidium lacinulatum). 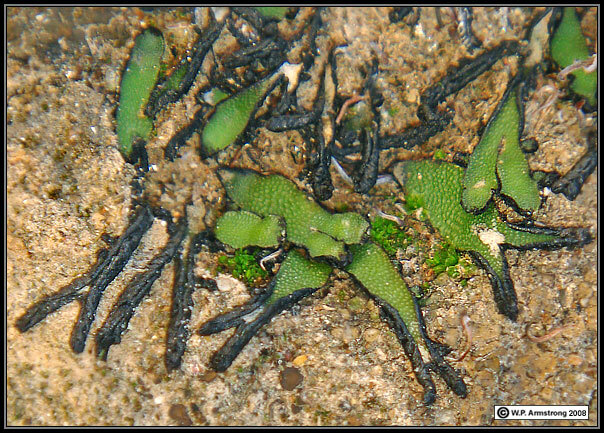 The rolled-up, desiccated thalli of a liverwort (species unknown). 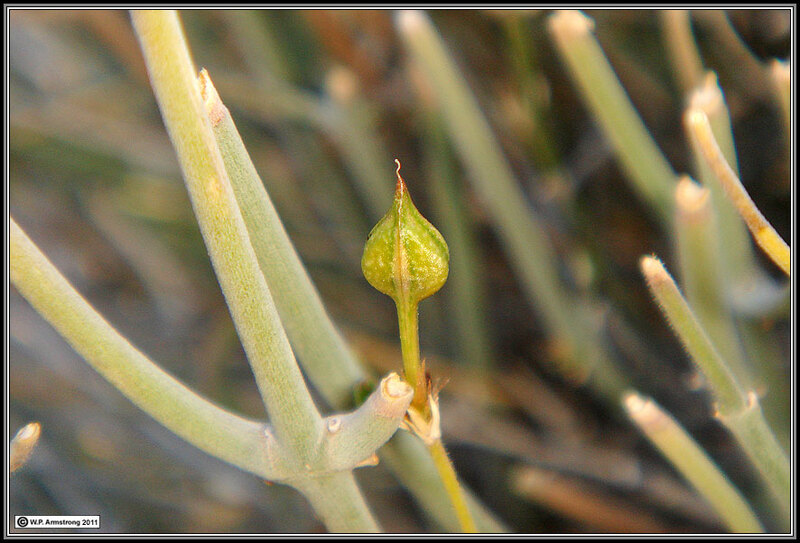 Distinctive fruit of Carlowrightia arizonica in Borrego Palm Canyon. 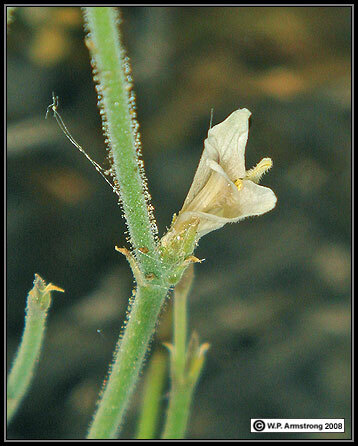 The inconspicuous corolla of Carlowrightia arizonica is only 10 mm long. Carlowrightia arizonica flower and fruit. 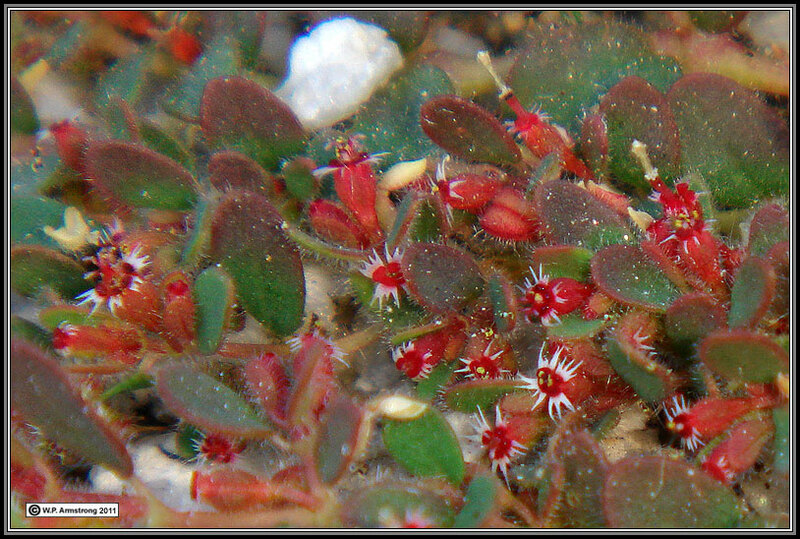 Grab lotus (Lotus hamatus = Acmispon micranthus). The derivation of the common name is apparent from the above image. 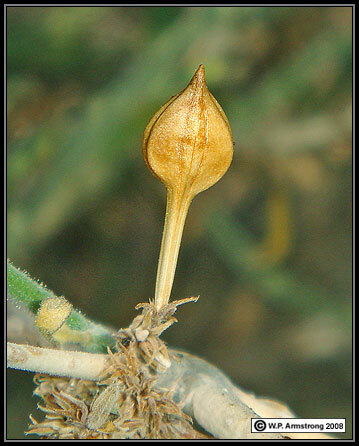 Each indehiscent fruit (legume) has a hooked terminal beak. 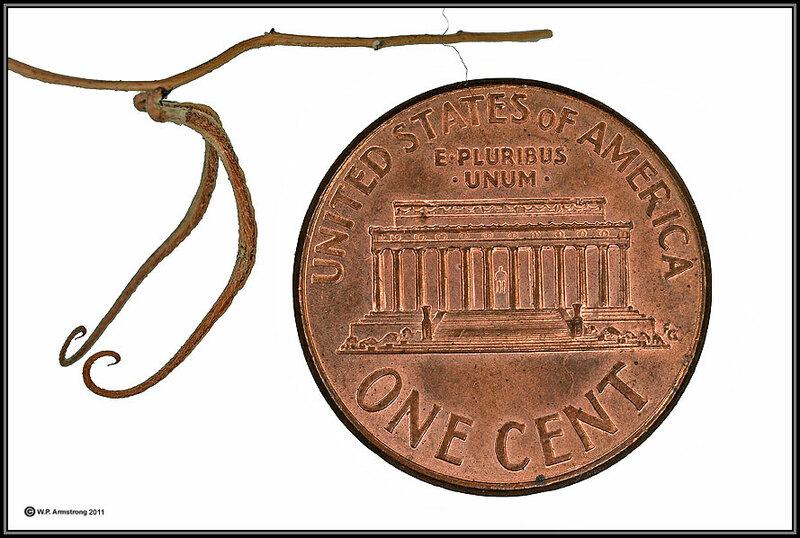 The double fruit greatly resembles a miniature devil's claw capsule (Proboscidea), a classic hitchhiker of the southwest desert region. 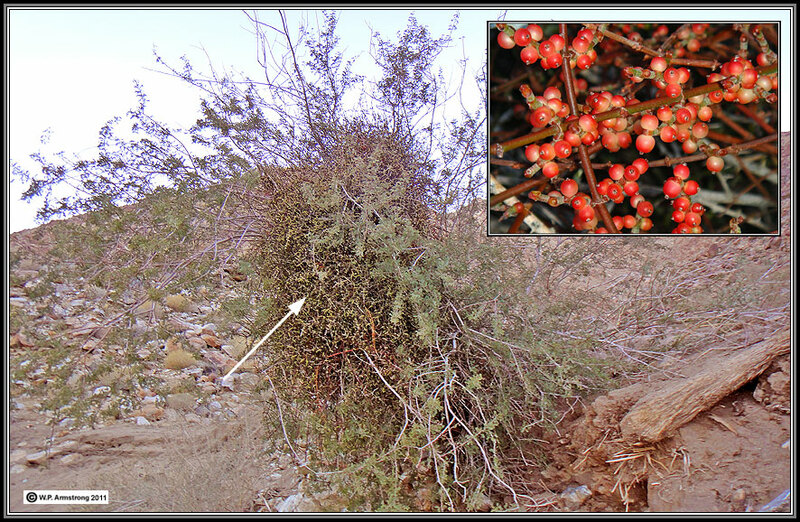 Female desert mistletoe (Phoradendron californicum) with flower buds (white arrow) on cat's claw acacia (Acacia greggii). 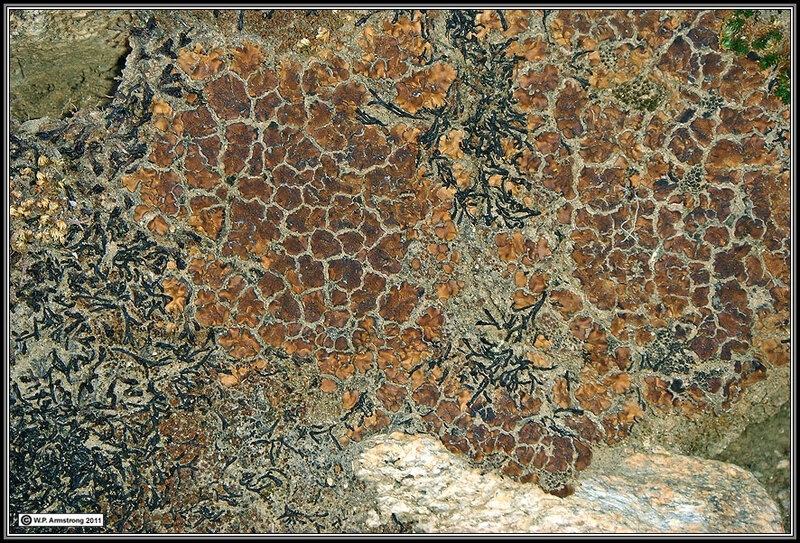 Inset: P. californicum with ripe fruit from a February 2008 image taken in Smoke Tree Wash. 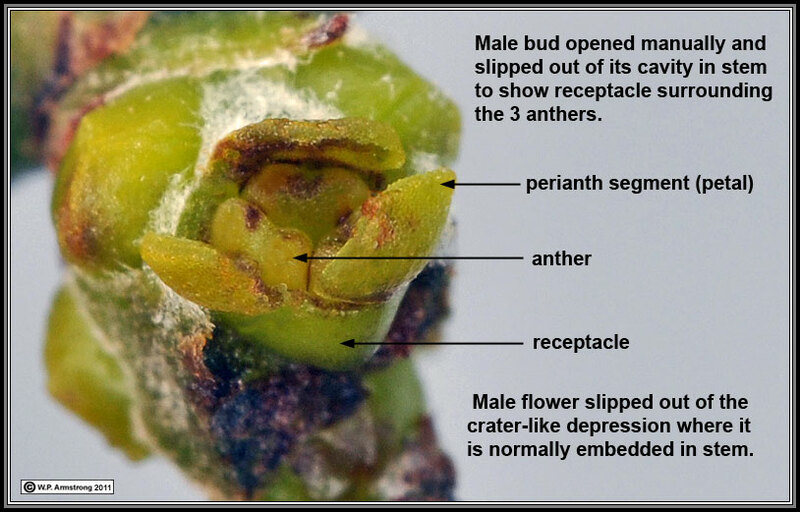 Female Phoradendron californicum with flower buds. 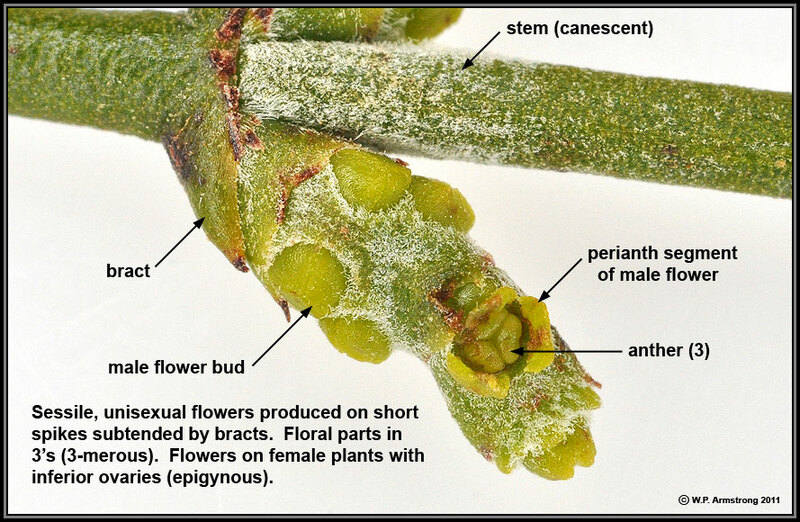 Two flower buds are open to show epigynous ovary. 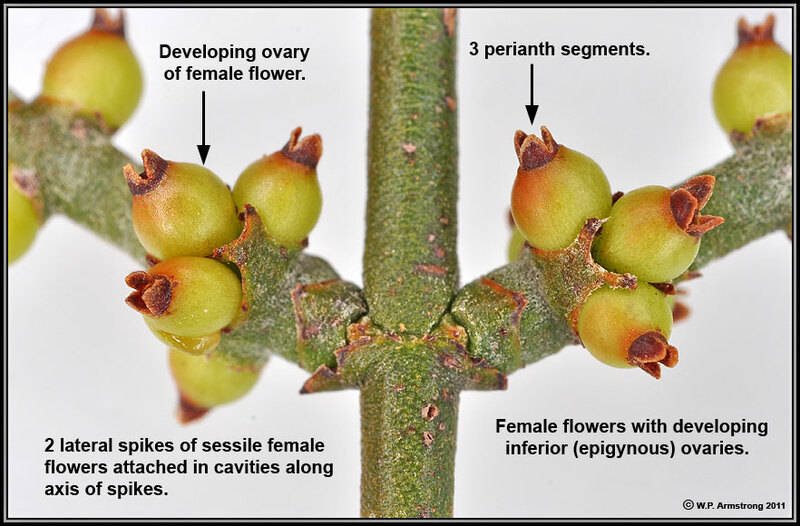 Female Phoradendron californicum with flowers and developing epigynous ovaries. One of many spikes on male Phoradendron californicum parasitic on cat's-claw acacia (Acacia greggii). 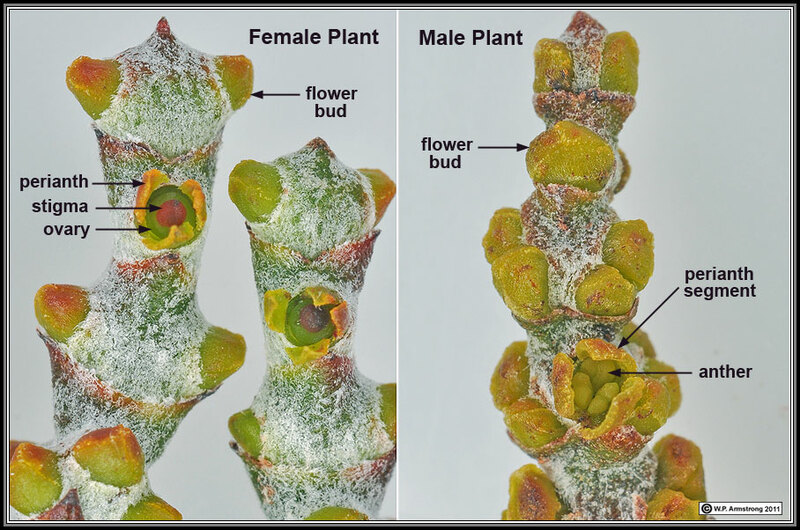 Female (left) and male (right) spikes of desert mistletoe (Phoradendron californicum) showing flower buds and opened flowers. Perianth segments are valvate in the bud (i.e. margins meet edge-to-edge without overlapping). 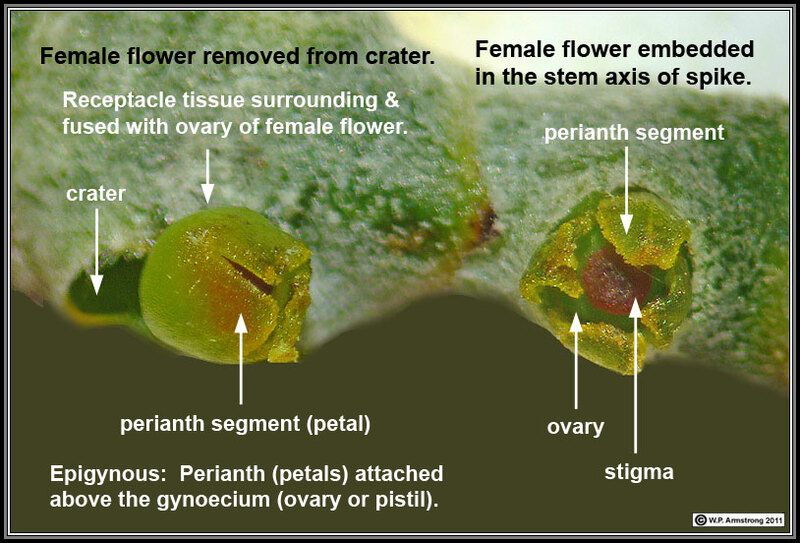 The flowers are typically 3-merous; however, one of the female flowers (left) has 4 perianth segments. 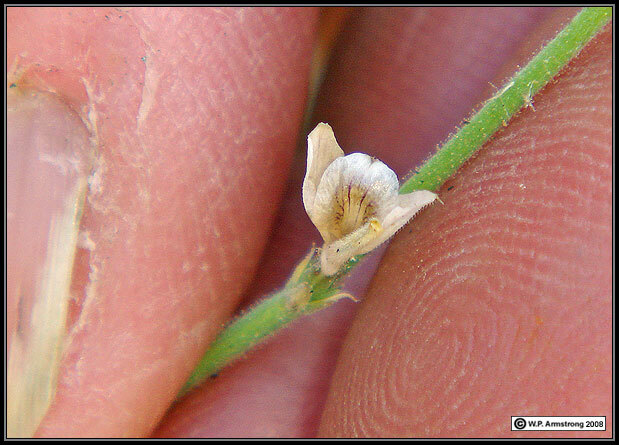 Male flowers contain 3 sessile anthers (right). The entire flower is surrounded by an inflated receptacle that fits neatly into the spike axis. The flower unit slips out of a concave depression in the axis. 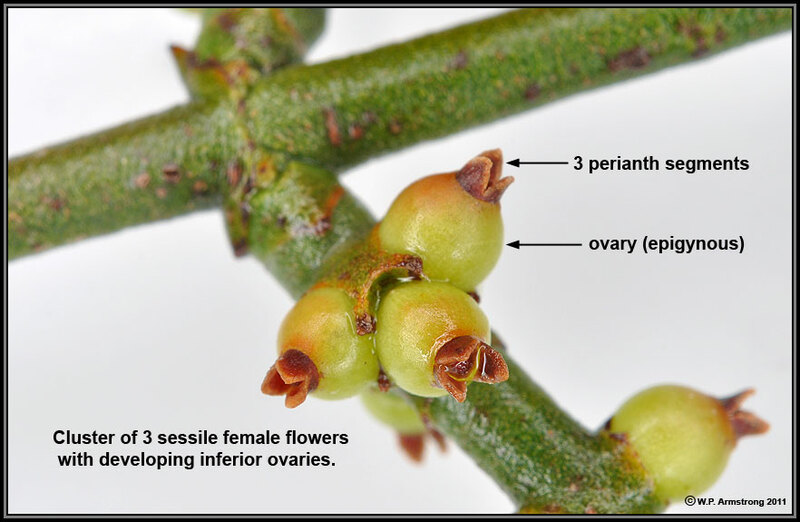 Female flowers are epigynous with the perianth attached (adnate) to the top of inferior ovary. 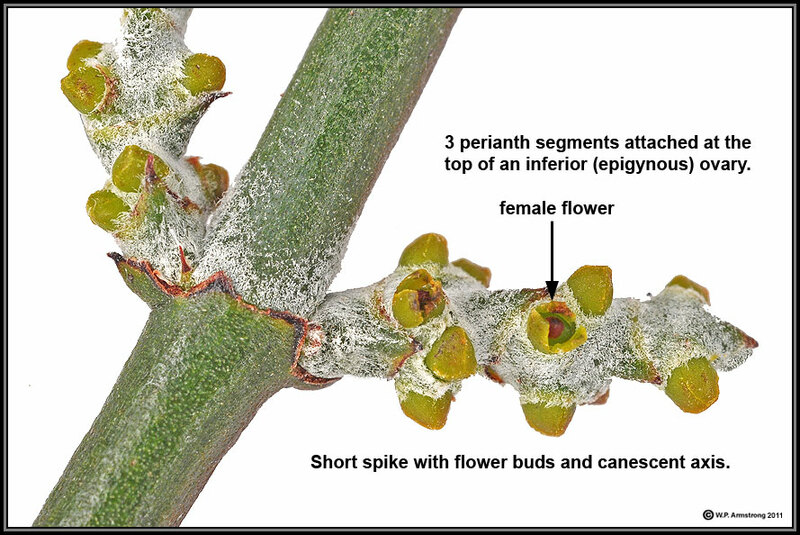 The perianth segments are interpreted as petals by Hennig S. Heide-Jørgensen in Parasitic Flowering Plants (2008). 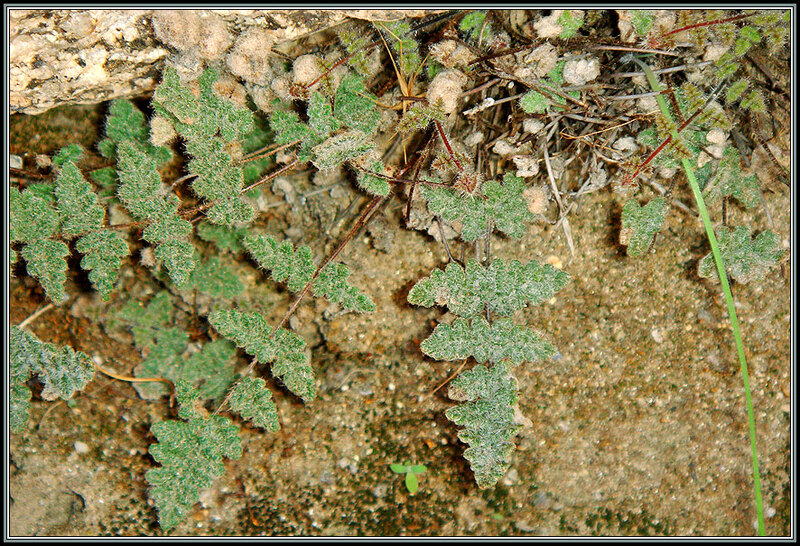 The spike stems are canescent, covered with dense, grayish-white hairs. Another desert mistletoe with scale-like leaves (P. juniperinum syn. 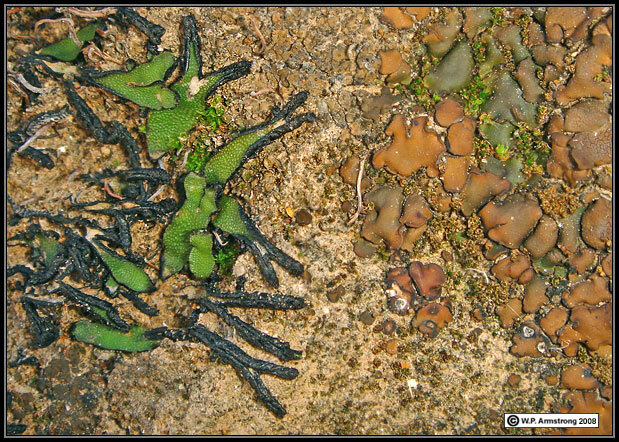 P. libocedri) has glabrous stems. The latter species is parasitic on Juniperus and Calocedrus. 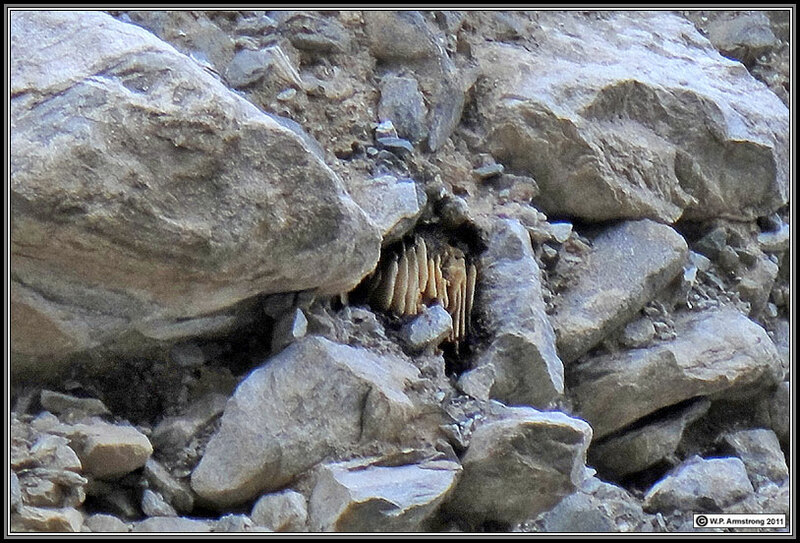 Distant view of vertical honeycombs of the honey bee (Apis mellifera) under the overhanging boulders. Borrego moon in the horizon.